Pastor Pam offered a wonderful message last Wednesday about the movement “down” in our relationship with God. We were invited to explore how being a steward of God, a disciple of Jesus begins at creation, where God first comes down to us, how God’s love comes down to us in Jesus and how God comes down to us and claims us just as we are in the water and promises of holy baptism. So as followers of Jesus in 2015, who live in the middle of a culture that becomes more secular and more consumeristic every day, how might God be calling you and me to think deeply about the ways that we use the money God has given to us and the time that God blesses us with every day of our life? When we think about caring for all that God has entrusted to our care – there are two major things that come to mind. Our time and our money. Throughout scripture, God’s people are encouraged, invited, even directed pretty intensely to think about both of these things. And specifically, to think about time and money in proportion to all that God has given them. And I need to be honest, when Wendy and I first began to think about proportionate giving in our life in Christ, the steps that focused on time and money seemed incredibly overwhelming. That being said, I can’t stress enough the importance of taking small steps rather than giant leaps when you begin to think about giving of time and money from a perspective of proportionate giving. Let me show you what I mean. First of all, I don’t believe that the most challenging part of God’s work through us as a congregation is money. There is more than enough money in the membership of Good Shepherd Lutheran Church to accomplish all that God is calling this congregation to accomplish. Our stewardship patterns of financial giving usually don’t reflect this truth, but it is a truth that I believe deeply in none-the-less. What I do think is an even greater challenge to God’s work through us, is our time. In today’s culture, time seems to be a much scarcer resource than our money. The most common answer to my question, “How are you?” is most often “I’m so busy.” or “I just don’t have enough time.” The scarcity of time is compounded greatly when one factors in the fact that you and I only have so much time in this world. Even for those of us who enjoy a long life, the reality is that it’s still incredibly short in comparison to the length of time within God’s unending creation. So, on the back side of your Takeaway sheet this week are two charts that I hope will help you and I think about proportionate giving of time and money. One chart is called Stewards of Money. We are using Burleigh County’s median annual household income for the dollar amount in this chart. Simply insert your own financial information to reflect exactly how this might speak to your own household. 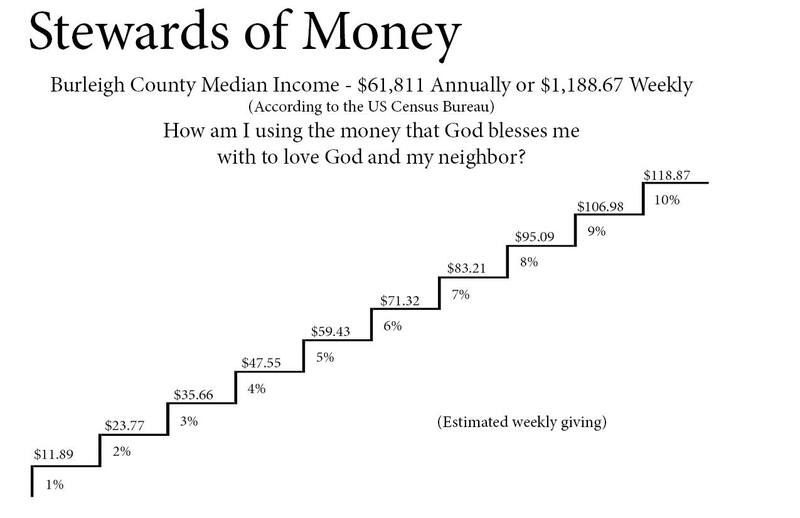 As you look at this chart, what percentage of the money that God blesses you with are you giving away in ways that show your love for God and your neighbor? If you find yourself to be giving at 1%, how might God be calling you to take a step of faith and move to 2%? And, wherever you find yourself on this chart today, how are you celebrating the ways that God is using the money entrusted to your care to love God and bless others? The other chart is Stewards of Time and takes a look at the proportionate use of our time based upon the 168 hours you and I are given each week. 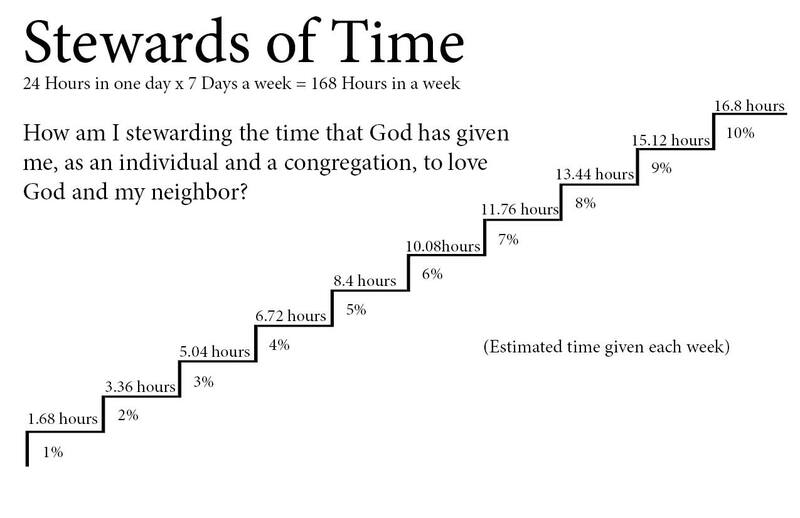 As you look at that chart, what percentage of your time are you setting aside to love God and your neighbor each week – 1%, 3%, or maybe even a full tithe of 10%? If you find yourself at 1%, how might God be calling you to take a step of faith and move to 2% of your time? And, wherever you find yourself on this chart today, how are you celebrating the ways that God is using the time entrusted to your care to love God and bless others? God entrusts you and me with some really incredible talents and an abundance of financial resources. As we grow in relationship with God and with each other as brothers and sisters in the body of Christ, how might the money we give through our offerings and tithes and the time that’s given through the hands and feet of more than four thousand baptized members of Good Shepherd Lutheran Church be used by God to share God’s love for all of God’s children? If we truly live out our faith together by trying to answer a question like that, Good Shepherd’s Ministry Financial Plan will always have an abundance of money available for God’s work through us. And feeling like you don’t have enough time to complete confirmation sermon notes and service projects or don’t think you have enough time to volunteer at any of the hundreds of opportunities at available in our community each week to love God and love your neighbor will no longer be stumbling blocks in how you live our your faith. Brothers and sisters in Christ, you and I have been given an awesome and wonderful calling as stewards of God, disciples of Jesus. Thanks be to God for your willingness to answer this call. And thanks be to God for God’s work through us that will continue to bless and serve others. Amen. This sermon is the third in Good Shepherd’s six-part Lenten worship series called “Stewards of God’s Love: The Down, In, and Out of Being a Disciple of Jesus.” This series is based upon the work of the fine stewardship leaders of the ELCA. You can find the primary resource we are using by clicking here. This entry was posted on Thursday, March 5th, 2015 at 8:08 pm	and posted in Recent Sermons. You can follow any responses to this entry through the RSS 2.0 feed.